Looking to learn more about Yellowstone wolves? The Yellowstone Wolf Genealogy Family Tree project is here to help. Yellowstone biologists say wolves have improved Yellowstone’s ecosystem since reintroduction in 1995. 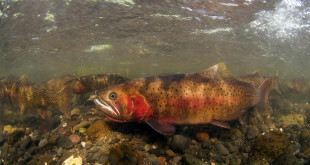 The new edition of Yellowstone Science highlights ongoing efforts to restore native fish to Yellowstone National Park. Elk numbers are up in northern Yellowstone, according to a recent survey from the Northern Yellowstone Wildlife Working Group. Further, more are migrating into Montana. The latest issue of Yellowstone Science will be dedicated to Yellowstone wolves, from reintroduction to the present. In Yellowstone’s wolf population, mange is causing more than fur loss. It’s causing wolves to lose body heat and alter their habits. The elk population in northern Yellowstone National Park/southern Montana is stable according to a new survey released this week.